Arabic is read from right to left, European languages left to right. Some Asian languages read in columns, while others are like pictographs; get all the info, then go back and build the meaning of the sentence (sort of like German, when you have wait on the verb). With many ways to read books, can it be a surprise that there are even more ways to read people? Sam (Samet) worked at our hotel in Istanbul; he used the book analogy when we had a lengthy conversation about the hospitality industry, its economic engine and the subtle nuances of human relations that meant the curtain between “you paid me to be a servant to you” and “how are you enjoying your stay” had to stay down–no matter what accents, expectations, or accidents. “It is like, every person who comes in this hotel is a book, and you must read them, but not all the lines. They have a whole life elsewhere, but here they want maybe something similar, maybe something different. You have to read very specific lines, look for the messages that are important, and not be distracted by the rest,” he said–in amazing English. Selling books, Jack and I read the customers who present themselves, trying to get them right. Back to front, straightforward, any hidden messages? It seems that, in every country, no matter the product, reading people is what makes a good shopkeeper. So Jack and I traveled 5,000 miles to find mirror images of our daily life in the people we met and the work they did. Now that there is some time and distance between us and our Istanbul jaunt, we’re beginning to analyze our experiences. Although we greatly enjoyed many things there were a few bumps along the road as well and that’s what I’ve been thinking about. Coming from a very small town to spend 12 days in one of the biggest cities in the world was always going to be a bit of a shock to the system and there’s no doubt that was a contributory factor, however there’s something else at play, I think. 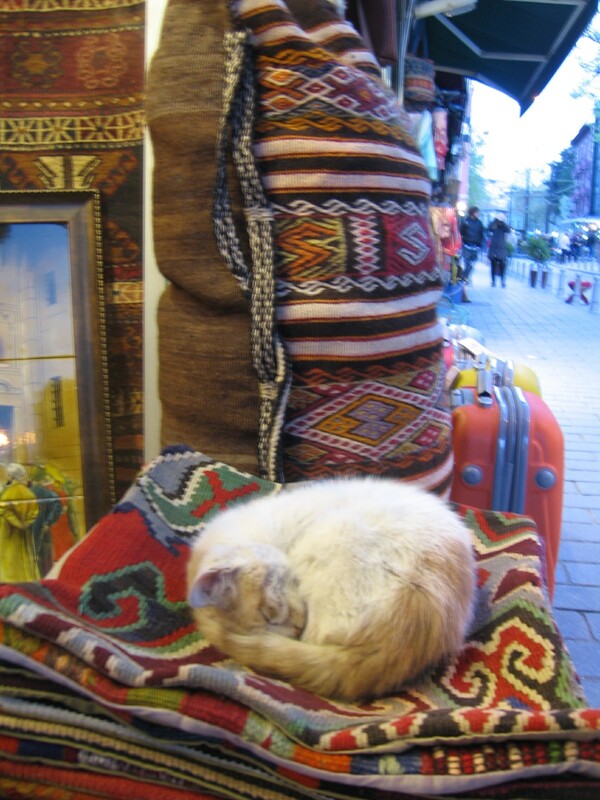 As tourists staying in a busy up-market hotel in the middle of a historic part of Istanbul surrounded by tourist oriented shops we were very conscious of being just part of a ‘passing trade’ and easily categorized as ‘rich pickings’. However we didn’t consider ourselves so easily pigeon-holed. We are ourselves shop-keepers who deal daily with customers (some of whom are tourists) and we like to think we treat them all as individuals and interesting people in their own right. All of this got me thinking about the times we felt most comfortable during our Turkish adventure. Not surprisingly it was when we felt we were interacting with people as fellow human beings, talking about shared concerns. 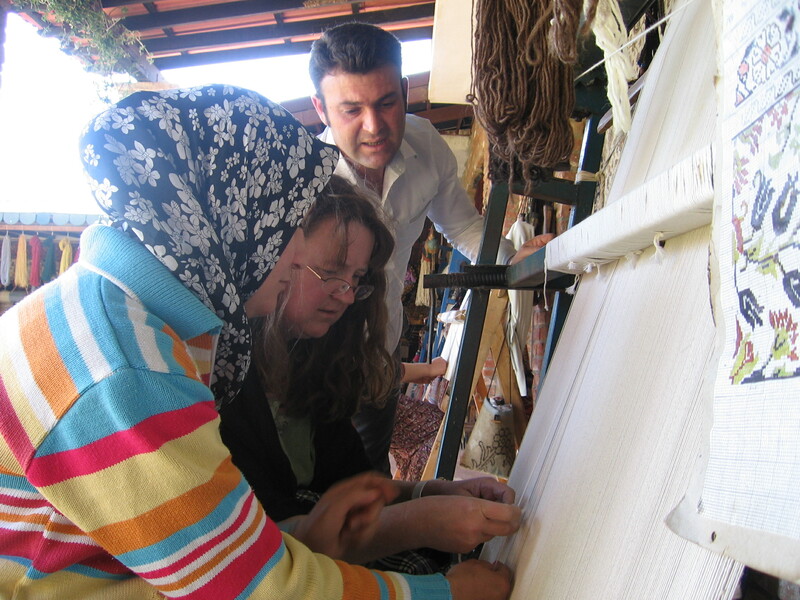 Mustafa the carpet seller in his shop across the street from our hotel; Okay and Samet who worked in our hotel; the manager of the tour office at Ephesus; the yarn shop owner who invited us in for tea after we’d bought from him and it didn’t matter anymore. Mustafa chatted happily with us about his family, hometown and world travels; Okay laughed when we named the local cats we’d photographed after hotel employees and took our concerns on board when we were fleeced by a restaurant; Samet talked of his ambition to study Sociology in the US; the office manager went from bland indifference when we arrived in the morning to real genuine concern when Wendy arrived back in the afternoon feeling unwell. It must be very hard to relate to strangers who cross your path fleetingly as customers when you are so dependent on them and very tempting to see them as ‘cash-cows’ to be milked and then forgotten about. Maybe it’s because we live above the shop and the line between our personal lives and our business lives is fairly blurred, or maybe it’s because in a small town many of our customers are also personal friends, but we really appreciated those times when we seemed to emerge from the masses and be recognized as ourselves in the frenetic surroundings of Istanbul. In the end these are the memories that will outweigh the blips – the counterfeit 100 Lira bill, the wayward hand in Wendy’s pocket in the Grand Bazaar, the heaving crowds and bizarre fashion show at Ephesus and the missed briefing when we arrived at the hotel – they will recede while the good bits remain. When Jack and I discovered that day trips from Istanbul could be had for a semi-reasonable fee, we decided to take a tour to Ephesus. Yes, that Ephesus. If you’re not a Bible person, that’s where the Ephesians lived. Semi-reasonable turned into not entirely reasonable but by then we were pretty far in to the process, so we said to Grand Wonder Tours, yeah, fine, take us for a ride. Still and all, the 5:15 a.m. departure, the 8 a.m. arrival at the tour company where they ignored requests for coffee or drinking water and removed two Canadians from seats on the bus for “false tickets” were all dwarfed by seeing the ruins of the old, old city. The tour started with the ruins of the temple for Artemis, then went to the house where Mary, Jesus’ mom, died. Very cool, that wee house, and kind of a spiritual moment. I mean, this was Jesus’ human mom we’re talking about. It makes everything so real, not just a story. 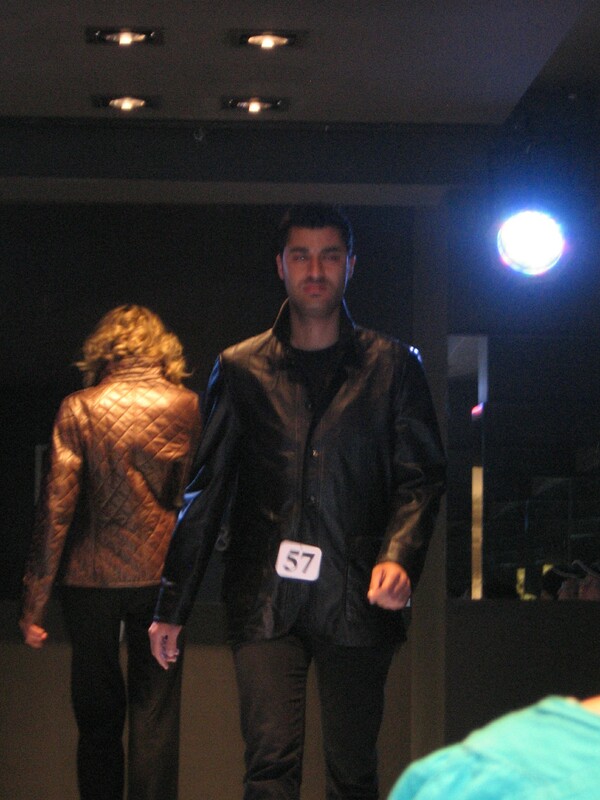 Then we pulled into this place called “alamede” or something like that, and got herded into a building where we were treated to a fashion show of leather and fur, complete with strobe lights and a hard sell. Not a good juxtaposition. Yes, I was all right. I had to be all right. 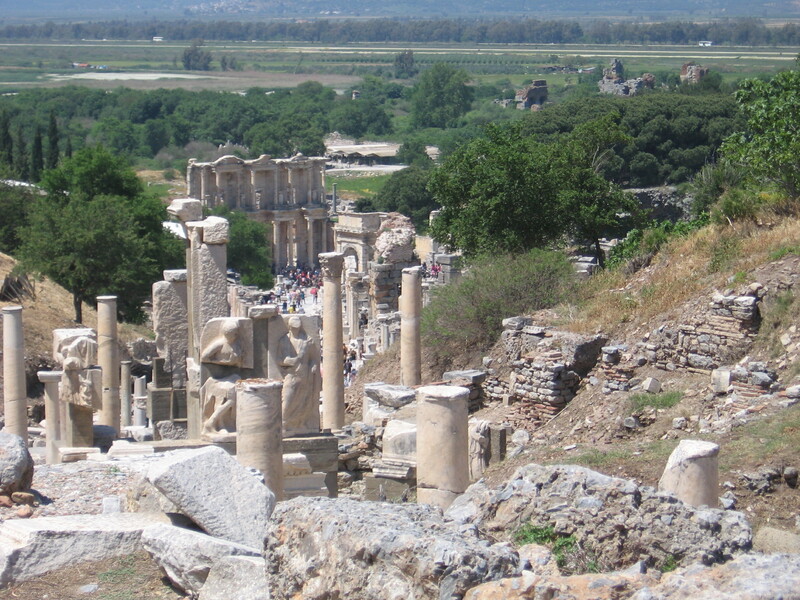 This was EPHESUS we were going to see, one of the great Biblical sites. Jack and I were so excited to see it. So were the 8,000 other people visiting that day. 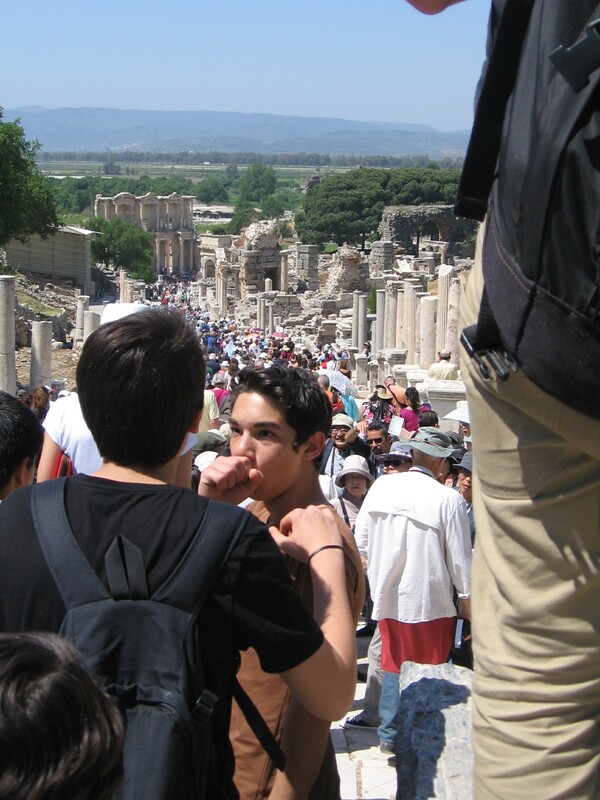 While Ephesus is crowded at any time, April 25 is National Children’s Day in Turkey; we saw children in every conceivable kind of school uniform, being pulled through the ruins by harassed-looking teachers. It doesn’t matter if she’s wearing full-on hijab or a track suit; you can tell a teacher on a field trip from every other person in humanity by that look of cynical dedication on her face. Here’s to you, ladies and gentlemen of the educating world. 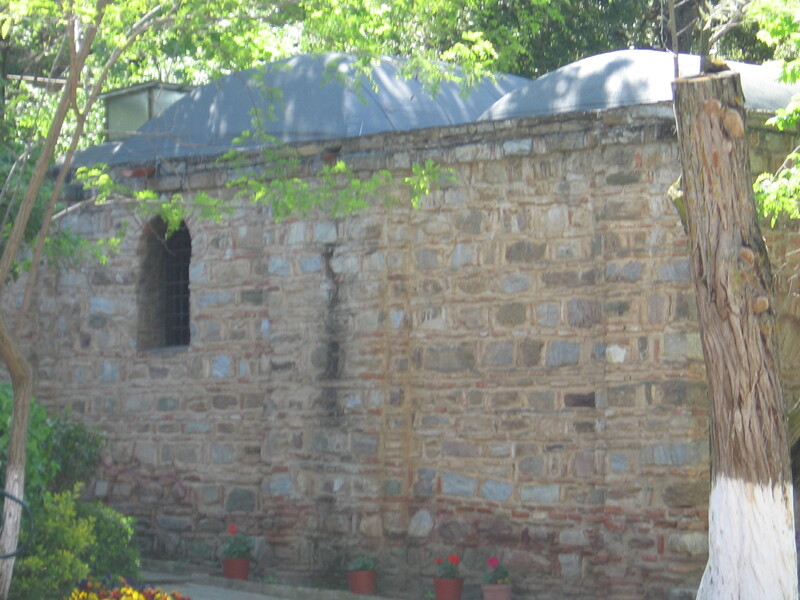 Besides the plethora of dear little children, one of my overwhelming memories of Ephesus will be the men’s public toilet- the really old one from the city, I mean–where I rested in the shade by sitting in one of the troughs that took the stuff away. Nice and cool. Just don’t think about the rest of it. Did you know they used to have ducks swim in the men’s toilet because their quacking and eating kept harmful bacteria-making wildlife away? When I began shivering in the 85-degree baking sunlight, Jack gave up any hope that this would pass and led me to a table outside the museum shop. It’s amazing what comfort food a diet coke can be. I think it was the first of my whole trip. We went to watch how carpets were made and I rallied long enough to sit and tie two knots in one–rather a highlight for a yarn nerd like me. Back on the bus, the nausea took over. Jack hauled out the plastic bag from the fridge magnet we bought my Dad from Ephesus (hey, he had to have SOMETHING and the guide books were silly) and I began losing my “traditional Turkish lunch, included in price” with as much unobtrusive grace and dignity as can be mustered by an American woman who has lost the will to live on a moving tour bus. We were supposed to wander the charming little town of Selgul and have dinner in a quiet restaurant before flying back to Istanbul, but back at the tourism office, Jack pulled two chairs and a table together and I climbed into this makeshift cradle, pulled the hijab scarf I’d been carrying for mosque visits over my face, and passed out. I awoke at 7. Jack said for two hours the people in the office had been tiptoeing around my body, casting surreptitious sympathetic looks while pretending not to notice I was there. I gave him a brave smile. He recoiled. I admitted as much, but noticed the computer screen next to him sported a Facebook site with a lot of photos of a very cute chocolate Lab puppy. He followed my gaze. “Is my dog. She is wonderful.” It was like pushing a button as this man who had seemed so surly that morning came alive with conversation. He was a dual citizen of Canada and Turkey, his wife Canadian; they’d planned to live in Canada but houses in Toronto were so expensive they’d come to Turkey and Sylvie, his wife, was learning Turkish before she started working. “Is a man’s world here, this is not right. Womens should do as they want, I am not one of those guys. But first she must learn Turkish and be comfortable in the country. 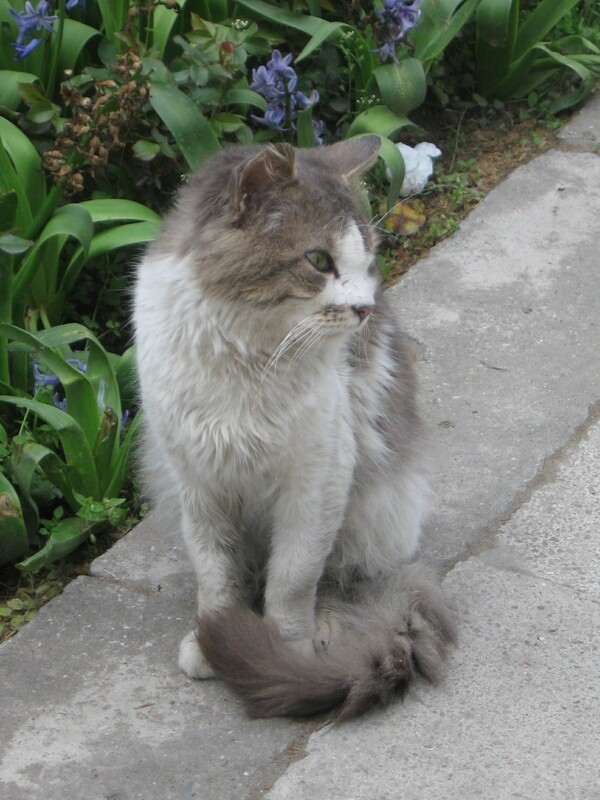 And she has this puppy to play with.” He smiled again at the dog, whose name meant “cutey-pie” in Turkish. “I tell you what,” he said suddenly. “You need tea. And you–” he indicated my husband– “you need whisky for looking after her. One moment.” He picked up the phone. A few minutes later a tea boy appeared, bearing something that had whisky and eucalyptus in it for me. I took one sniff and my sinuses opened wider than the Bosphorus. The man grinned. “Yep. It will take care of you. 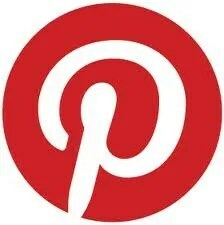 Salu.” He and Jack raised their glasses. I raised mine. Life looked a little better. We exchanged horror stories about why we hated all Canadian airlines in general and Toronto Airport in particular, discussed favorite airlines–Lot for him, out of Poland; Thai Air for me; Al-Italia for Jack–and chatted like old chums until the taxi driver came to take us back to the bus terminal. 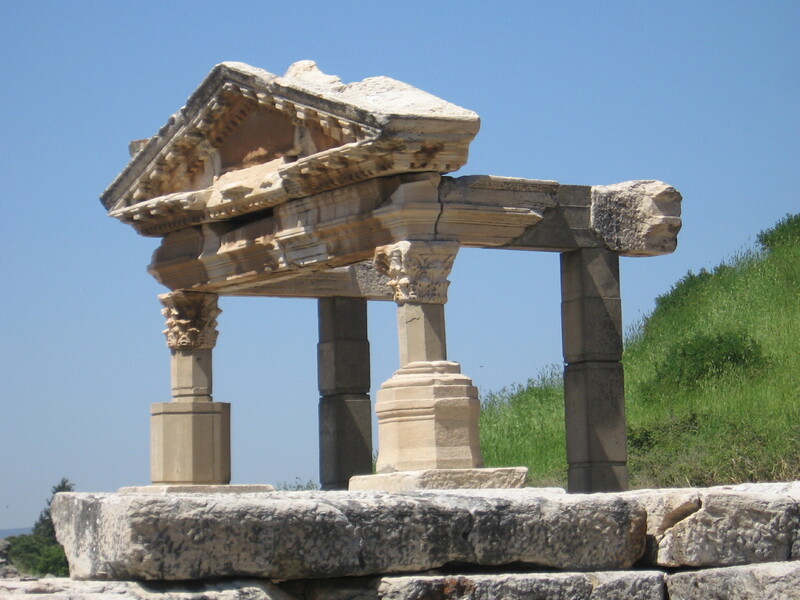 So now I’ve seen Ephesus–or been done by it, as the case may be. And I will remember the strong Mediterranean sun, and the stronger hospitality of strangers to the puking American tourist. 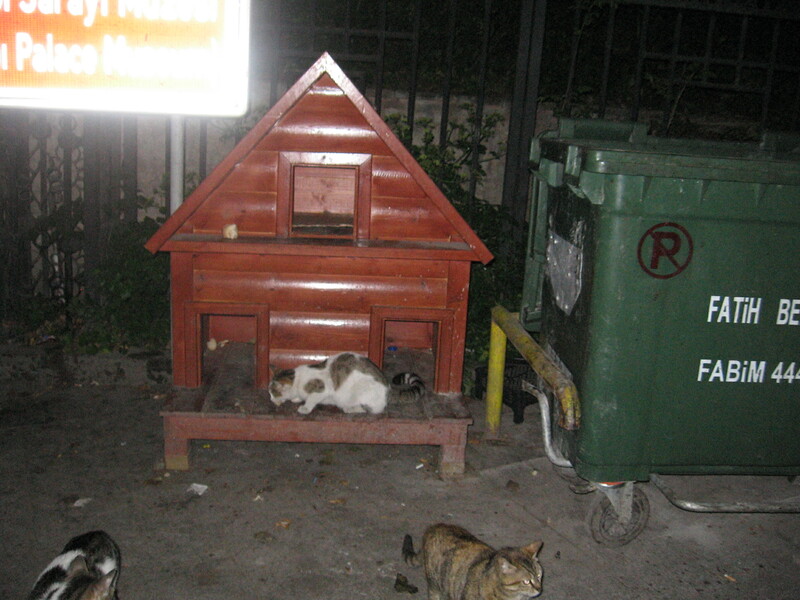 There are many cats in Istanbul, and because of Turkey’s excellent training programs, they all have gainful employment. 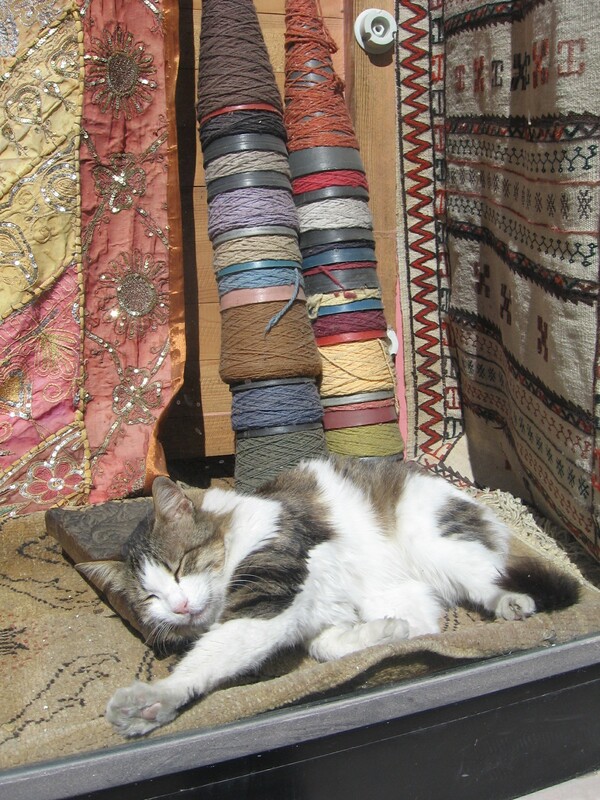 Zeynep weaves carpets just down from the High Street by Topkapi Palace. 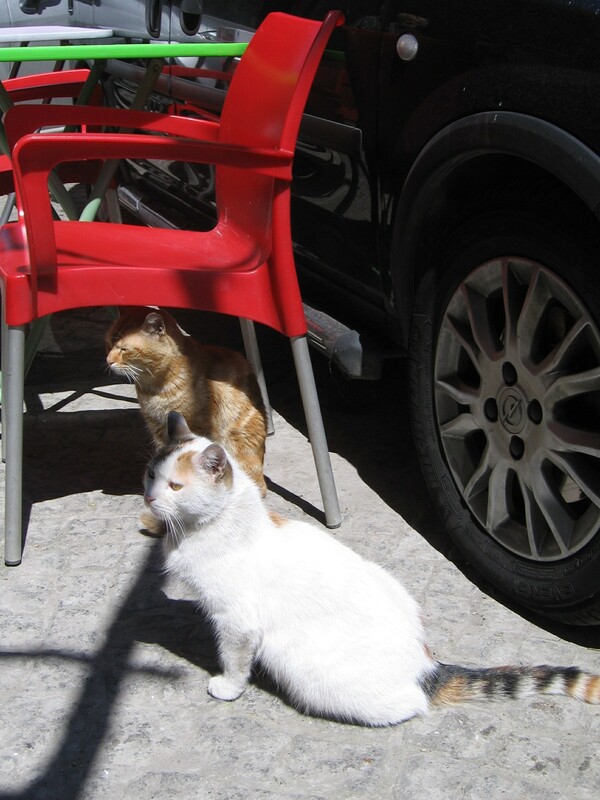 Below, Turker and his sister Ceren run a sidewalk cafe near the Galata Tower. 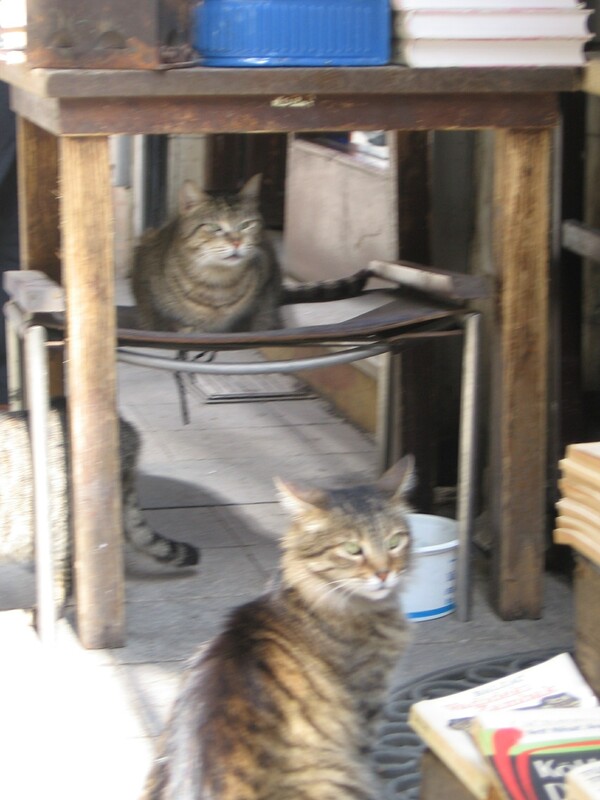 At the palace itself, there are several cats working shifts at the guardhouse set up for their convenience in bad weather. I didn’t get all their names, but one night I took some leftover food up, and when the bag rustled as I dumped it, cats came from everywhere. 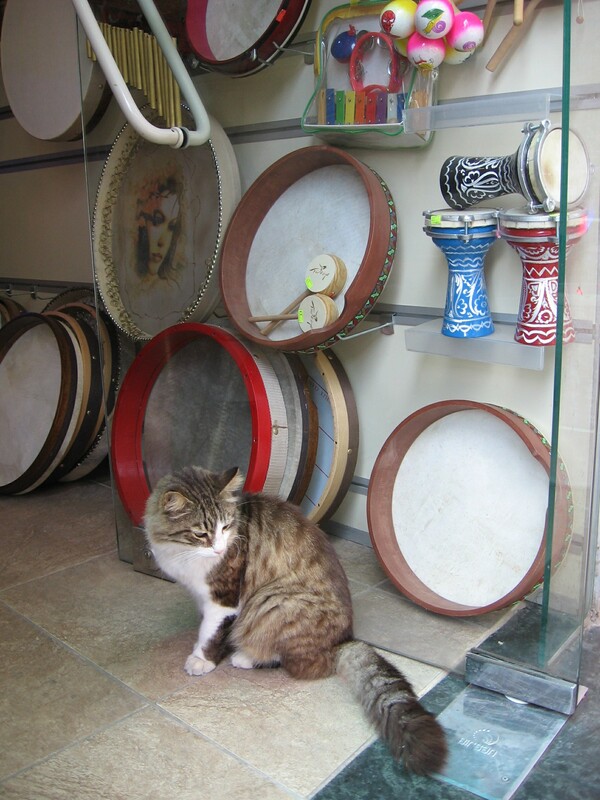 Amane sings with a jazz band in the newer part of Istanbul, up near the High Street from Galata, but she is also putting herself through school by selling instruments in a music shop. She teaches beginning drums for children. Ahmet was on guard duty at the Blue Mosque when we walked up one night, but the mosque was closed except for those who wanted to pray, and Ahmet was clearly embarrassed that we were still there as tourists. We thanked him and left quickly. Ayse paints ceramics outside the Grand Bazaar; she was on break when we met her. 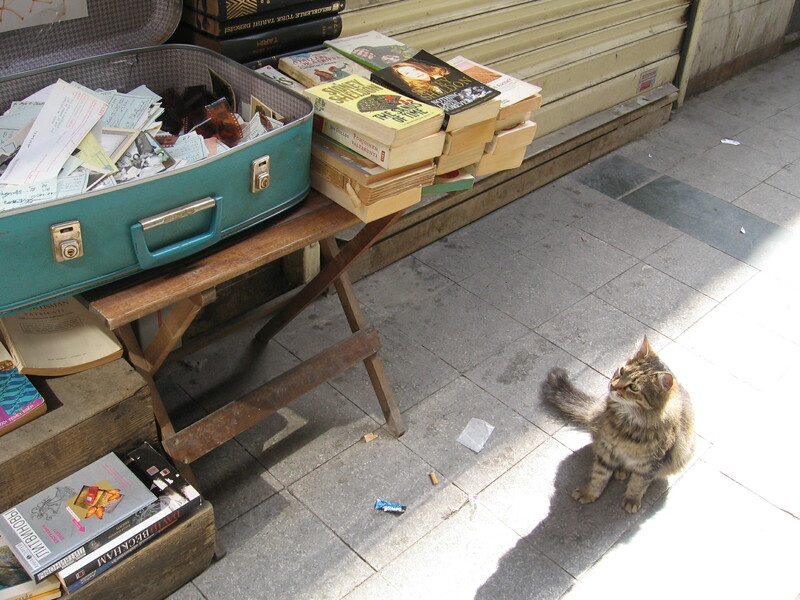 Of course we were delighted to meet Suliman and his wife Fatma, who keep a bookstore in the market district. 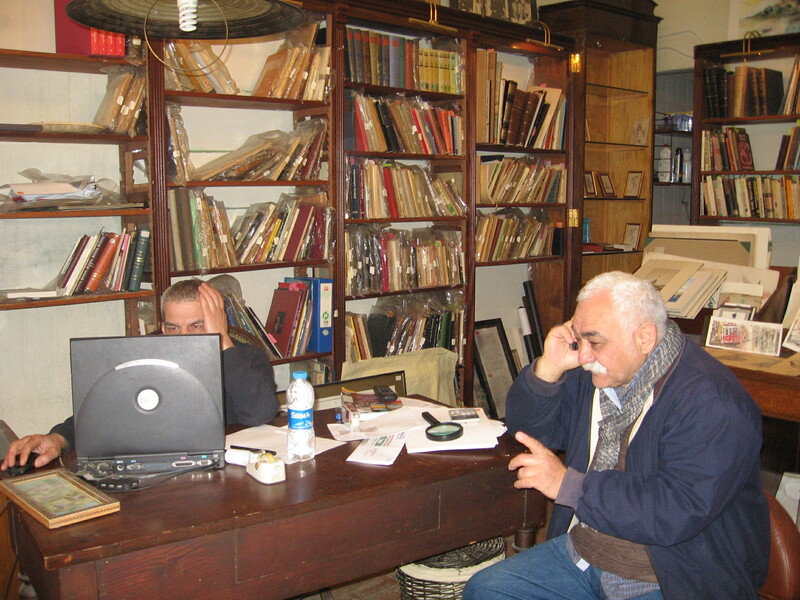 They introduced us to their colleague next door, Mahmood, who specialized in antique calligraphy. 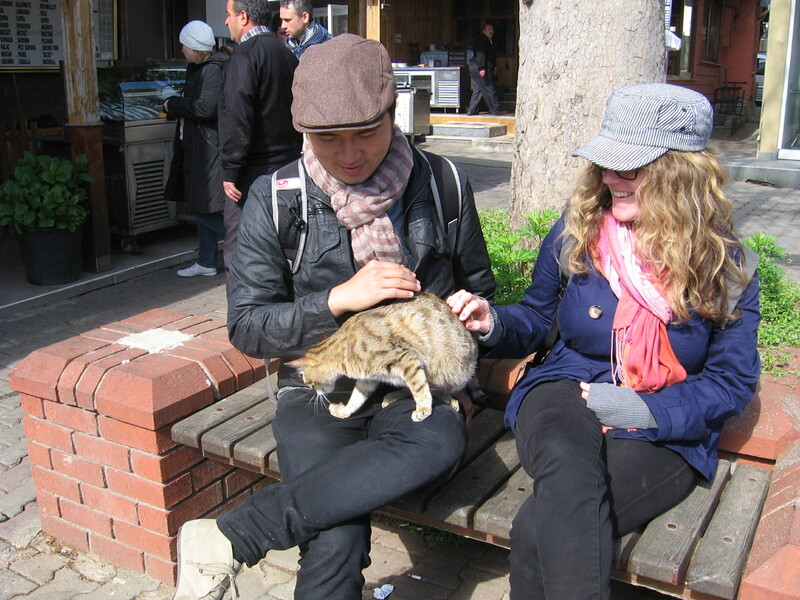 This wee cat, whose name we didn’t catch, was begging at a fishing village on the Bosphorous tourism boat stop. She leaped into this couple’s lap and made nice, then when fish from his sandwich was not forthcoming, clawed him until he dropped it. Clever little bugger. 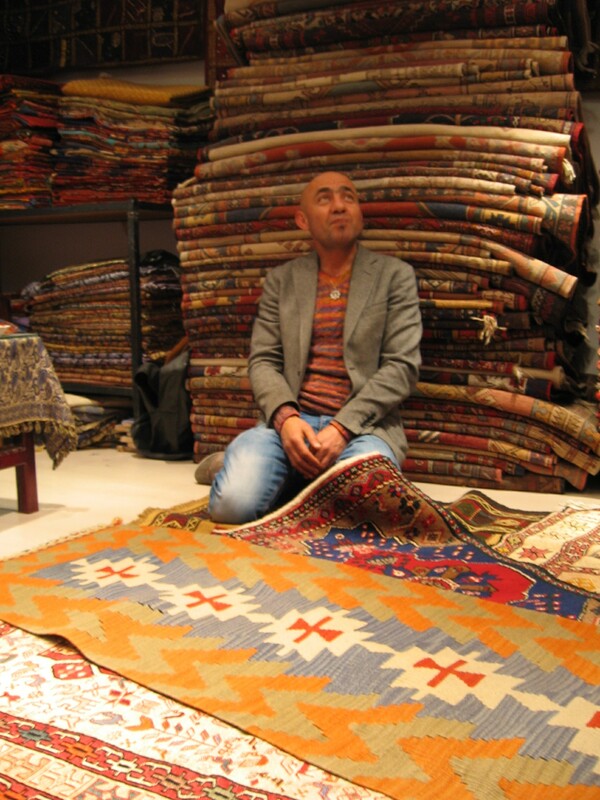 Sultan is teaching his human the carpet trade in the Sultan’s stables bazaar, just off the Blue Mosque. 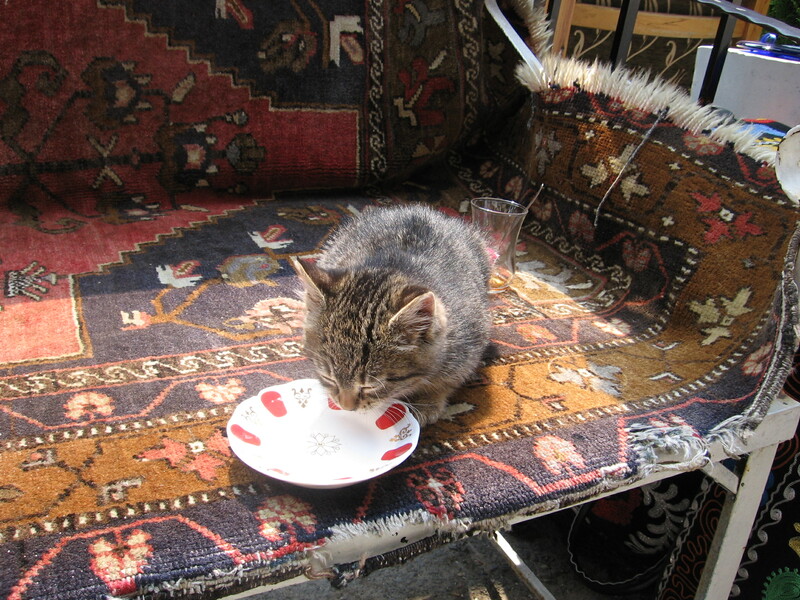 Sultan was very thirsty when we came by, having just finished his lunch of salami, and his human staff were appreciative when I poured water from my bottle into his saucer. Theodora poses for pictures with little children in Gulhane Park, for the very reasonable fee of one Turkish Lira per photo. 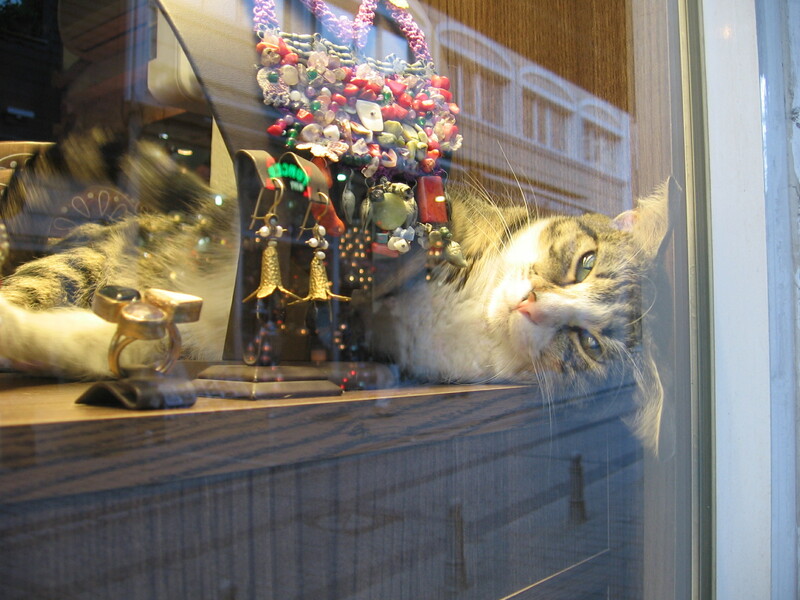 And finally, Topkapi (that’s her stage name; her real name is Tiffany) moved here from France and models jewelry for the Ti Amo jewelry store, across the street from the Sirkaci Konak Hotel in the Old City. Topkapi only works nights. At the Archaeological Museum in Istanbul, Jack and I looked at clay tablets bearing letters from 1200 or so BC, and gravestones from sometime between then and 300 BC. There is nothing new under the sun. One letter informed a man that the woman writing it was marrying “the farmer” instead of him. One stipulated that the wages for performing an exorcism were two sheep: one male, one female. Another extolled the virtues of Hypodia’s parties and invited the recipient to one. A gravestone erected by one Olympios suggested that, although he died a civil servant, he SHOULD have been elected provincial leader, and would have been had it not been for the jealousy of others, and he hoped the guy who’d gotten it rotted in hell. Hades, actually, but you get the point. There is nothing new under the sun. From the time we’ve been able to write, we’ve focused on just a few things. People want love. We want a life that we feel fulfills the talents we believe ourselves to posses. And we want good stories. Beside the gravestones–some of them very sweet and touching, actually, like the one from the woman who said she was “weeping, wailing, and mourning for her dear departed”–each sarcophagus in the museum had a tale told in figures around it: Psyche and Eros; how Apollo got married; the death of some guy I’d never heard of in a drunken brawl. Then and now, 2000 BC or AD or whatever system you use, there is nothing new under the sun. The names change from Mahmud to Matthew, the hats morph from turbans to ball caps, and the women’s dresses get shorter or longer, but we people go on, chasing love, money, and a good job. And telling stories about ourselves and each other. Kinda reassuring, ain’t it? Although I think exorcisms cost more like twelve sheep now. Istanbul is a city of 22 million people, and most of them seemed to be in the Spice Market and Topkapi Palace the same days we were. 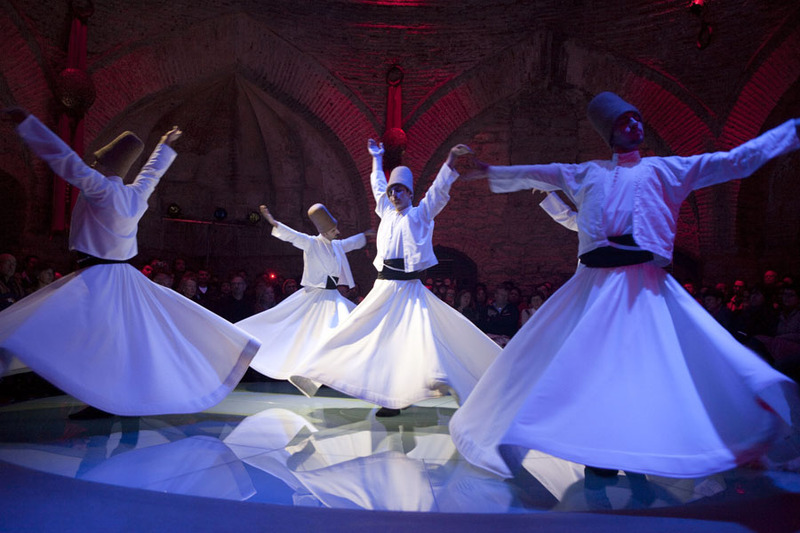 On day three amid jostling crowds, avoiding shopkeepers accosting in six languages, dodging buses and taxis as they honked insults while dueling for supremacy on the narrow Old City streets, we booked tickets to see the Whirling Dervishes. Not knowing quite what to expect, we arrived at what appeared to be a sophisticated ‘theater in the round,’ complete with colored lights and set in an old mosque. My heart sank as I got the feeling that we were in for a typical ‘folklorique’ experience. When the four musicians appeared, dressed in identical costumes and playing tambur, whistle, psaltery and various drums, my first impression seemed correct, but as the music started I realized that this sounded like the real thing–a strange alternating major and minor key piece based on an oddly exotic scale. Gradually the music set a mood. Then the dervishes appeared and the audience—until then restless and clearly waiting for something to happen—settled in as, without leaving our seats, we were moved to another place. A feeling not unlike the gathered silence of a Quaker Meeting enveloped the space as these five men in high hats and white garments inclined their heads, raised their hands (left palm down, right palm up) and took turns to lead the others in their ancient stately whirling dance of Sufi worship. Seemingly oblivious to the 200 or so observers in the circle of tiered seats around them, they whirled, white coats billowing, with eyes half closed, whispering the words of prayer. It was elegant, dignified, reverent. When it was all over we wandered back to our hotel through jostling crowds, city traffic and accosting stall keepers. But we couldn’t get the image of the dervishes out of our thoughts. A sense of calm suffused the night. Cynically, Wendy and I joked that these men got up this morning and went to their jobs as taxi drivers, stall keepers, and tourist boat operators–but so what if they did? Calm is calm, worship is worship, and moments of honesty about loving God in a busy life are worth clinging to. Wendy’s friends the GGGs (Grammar Guerrilla Girls) are handling the blog while we’re out of town, but on alternate days when scheduling permits, Jack and Wendy will post a few travelogues. Those looking for more Little Bookstore action should keep up with the GGGs on the blog’s regular days (M,W,F and Saturday) and those wanting to hear about the misadventures of bookslingers Jack and Wendy abroad, check in on Tuesdays, Thursdays, and Sundays. Jack and I arrived at Charlotte airport and found first thing that our flight to Chicago, thence to Frankfurt, thence to Istanbul, had been delayed. “We’re never going to make it to Frankfurt. This trip is a disaster,” said my dour Scots husband, five minutes into our trip–and then couldn’t understand why I burst out laughing. “Harumph,” he added for good measure, and I doubled over, honking and snorting as a security guard gave me a stern look and all the other people at the gate A16 edged away from the lady having a fit. We were in fact so early to the airport (another husband thing) that we asked to get on the flight before our delayed one–also delayed. The nice lady at the counter did just that, and we found ourselves in the privileged position of being EARLY to Chicago. Which of course meant we had time for a pizza: what else would one do? Fat and sassy we waddled onto our overnight flight, and woke the next morning, cranky, in Frankfurt. If one doesn’t arrive cranky, Frankfurt airport will take care of this for you; the place is joyless, soulless, and just plain nasty (although the city is nice). Arriving in Istanbul at 2 pm local time – about 7 in the morning back in Virginia–a long line at passport control provided ample people-watching opps. Our favorite was a group of small children, probably from Malaysia, all wearing caps proclaiming they were part of an international children’s program designed to get people from very different places together to meet each other, and maybe reduce the urges some people have to attention-seek by blowing things up. As we watched, this little flock of hat-wearing goslings sailed in and out of the security tapes intended to hold people tightly in queues, weaving among exhausted passengers of every persuasion–who smiled benignly at the kids and each other as the wee’uns flew over their feet and around their luggage. Even the guard was grinning. I’m proud to be part of a world where little hat-wearing children can unite such disparate, tired people into a group. I’m not wearing white tennis shoes, and Jack’s Scottish sweater is over a Walmart flannel shirt. Heh. This could be fun. 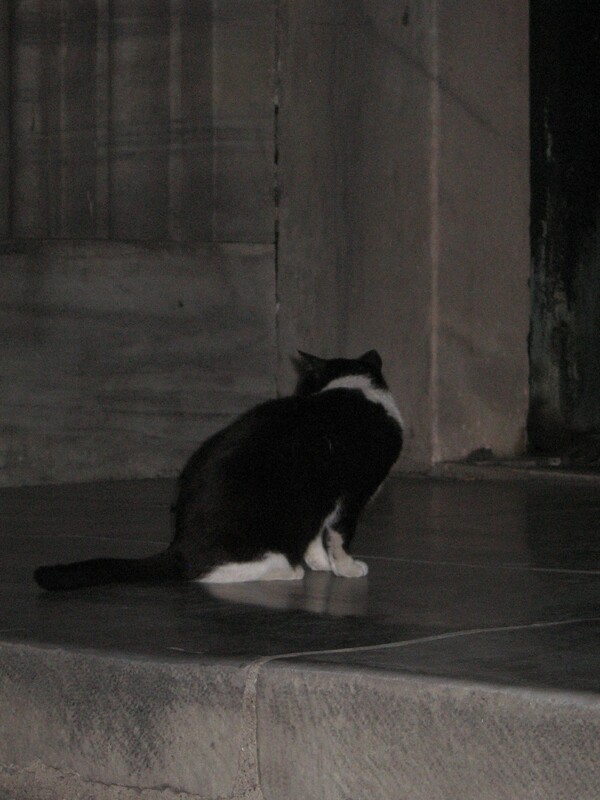 Tune in Sunday for a description of the Topkapi Palace Harem and other strange but wondrous people-watching moments.